Sorry, there are no shows on sale at Criterion Theatre right now. The Criterion Theatre first began its life as a theatre (having previously been a public house) in 1874, showing Henry Byron's 'An American Lady'. Ever since it has maintained a reputation as one of the best theatres in the London. During the Second World War the theatre was requisitioned by the BBC. The fact that the theatre space is underground meant that it was safe from the blitz and was a place where people could come to see light entertainment. After the Second World War the theatre became renowned as a place to see avant-garde works such as Samuel Beckett's "Waiting For Godot". The building itself is a place of beauty - with a lavishly painted roof, crushed red velvet throughout and seating to suit all budgets. A small theatre venue that seats only 588 people - allowing you to enjoy the intimacy of the venue and feel that you are right up close to the actors in stage. It sits directly on Piccadilly Circus - a famous landmark at the centre of London, so when you are heading to the venue you will be able to visit other tourist attractions in the area. You can also enjoy the lively atmosphere of the square before and after the show. The theatre is fully air conditioned, making it a good option for the summer performances. The nearest tube station is Picadilly Circus which is a 1 minute walk away. You can also use Leicester Square which is a 3 minute walk away. The nearest train station is Charing Cross which is a 5 minute walk away. You can use bus numbers 3, 6, 9, 12, 13, 14, 15,19, 22, 23, 38, 88, 94, 139, 159 and 453. The nearest Q-Park car park is Trafalgar Square and the next nearest is Chinatown. There are two wheelchair spaces in the back row of the Upper Circle. Please contact the theatre to book. 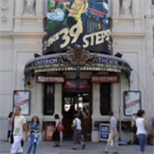 Wheelchair access is through the step free entrance beside the Stage Door in Jermyn Street, behind the theatre. There is a portable induction loop available at the Box Office and a Sennheiser infra-red hearing system in all parts of the auditorium. Headsets are available for patrons from the Cloakroom. Assistance dogs are not allowed into the auditorium but theatre staff are able to look after up to two dogs per performance in the Theatre Manager's office. For more information and to book, call the box office on 020 7839 8811.